A powerful key position player and outstanding leader of men, Peter Daniel enjoyed a moderately successful VFL career before making a name as one of the most accomplished coaches in modern Tasmanian football. 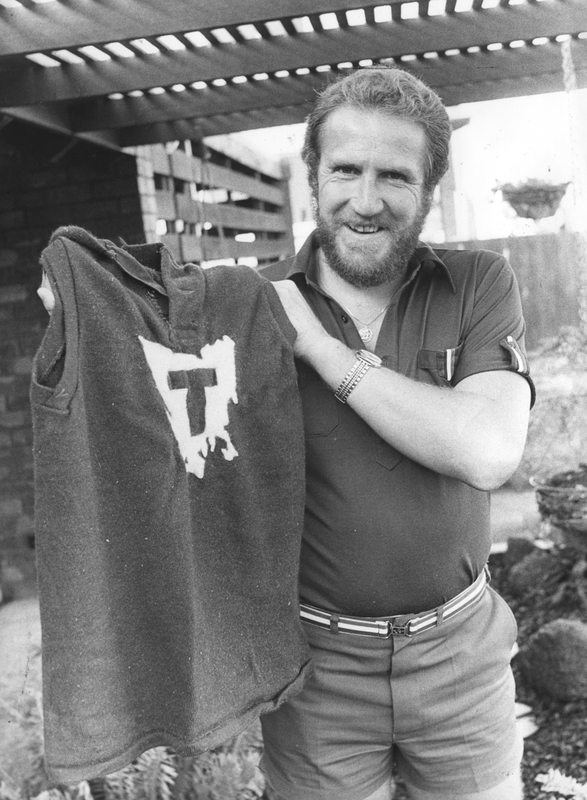 Born in Broome, Western Australia in 1947, Peter Daniel had enjoyed a seven-year, 100-game VFL career with Essendon before he accepted the captain-coach position with North Launceston ahead of the 1975 season. The Robins had not tasted premiership success since 1963, however in Daniel’s first season in charge North waltzed to the premiership with a 52-point win over Scottsdale, and then got to within four goals of the state title in one of the highest-quality games of club football ever seen in the state, opposed to Peter Hudson’s Glenorchy. Daniel’s performances as both player and coach during the season instantly drew the attention of NTFA and state selectors, and he was chosen to represent both the association and his adopted state during the year, including at the National Knockout Carnival in Melbourne. The 1975 flag was the catalyst for North Launceston’s greatest period of prolonged success since the late 1940’s. Daniel brought a new standard of professionalism to the Robins, resulting in seven consecutive Grand Finals and five premierships between 1975 and 1981, including four in a row from 1978-81. Daniel’s outstanding leadership through both words and deeds was a key factor in the success, and it was hardly a surprise that he was the obvious choice as coach of the NTFA representative side every year from 1976-79. He took another step up in 1980, taking charge of the Tasmanian state team for matches against Queensland and South Australia (winning the latter) and retaining the role for the National Carnival in Adelaide; just before the Carnival, he was also selected to coach an invitational ‘Rest of Australia’ side that played the VFL at the MCG. Arguably his greatest coaching achievement however came the following season, when he coached the Greater Northern League team that sensationally defeated the VFA by 10 points in Devonport, a match the Tasmanians were given only the slimmest chance of winning. At the end of 1982, Daniel departed North Launceston after eight years at the club to coach WAFL side Subiaco. A string of poor results with the Lions led to his dismissal after only 11 games, and the following year Daniel was back in Tasmania, spending a year away from the coaches box working with the NTFA. The absence would not last long however, and in 1985 Daniel was appointed coach of City-South. He would have the distinction of being the Redlegs’ final senior coach before the early-1986 merger with East Launceston, and post-merger he remained in charge of the newly-formed South Launceston side that played in the NTFA. Daniel departed at the end of that season after the NTFA’s disbanding left Daniel without a position, and after another short period out of the game Daniel embarked on his final coaching role, this time with Clarence in the TFL Statewide League. He guided the Roos for two seasons in 1989 and 1990 and was successful in getting his charges into the finals in both years, but after finishing 1990 as minor premiers Clarence was bundled out of the finals in straight sets, and Daniel was replaced as coach at season’s end. Post-Clarence, Daniel served as an inaugural member of the Football Tasmania board from its formation in 2000, serving as the Chairman of the Development Authority, while away from football he enjoyed a long career as a teacher for more than 40 years.